. 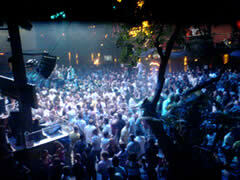 : cmpdesigns Journal Entry: The Ibiza Trip... :. I guess some of you may be wondering why I havnt posted about the trip to Ibiza yet. We did go (even though we had a 10 hour delay on the way over), and had one of the best holidays ive ever experienced. Definitely going again sometime. Our first night was Pacha. We only just got there in time because of the delays (we found out later that our plane had been struck by lightning! Scary!) Pacha was pretty good, but I couldn't really enjoy it properly because I was so tired. Eric Morillo was incredible! Amnesia was absolutely fantastic. Even better than I had imagined. The place is huge! (The Image above is of the small room. Taken from the VIP area.) We managed to blag our way into the VIP area, which was alright I guess. Felt a little strange being up there whilst everyone else was dancing downstairs. Bumped into Judge Jules' manager, who one of the girls knew. Paul Van Dyk was playing the first night we went to Amnesia, and was way better than he has been when ive seen him play in the past. The atmosphere was electric. Drinks prices were sky high though, think it was about 9 quid for a vodka and coke. The other memorable day we had over there was Space. Obviously, we went to Space in the early afternoon so we could dance under the sun with all the planes flying overhead. Had a quick chat with Jonathan Ulyssees, who turned out to be a really sound guy. The music was fantastic. Tiefschwarz were playing in the room next door. If I have any regrets, I can't believe I didnt make it to the beach once. I know its not really that kind of holiday, but i should have made the effort. The guys and girls said that both Bora Bora and Las Salinas beach were brilliant. When your not getting in 'til 9-10am from the clubs, its difficult to motivate yourself to go to the beach, and im a guy who really likes his sleep. The comments on this site are posted immediately. However, the site administrator is sent an email notification with a link to remove the comment if deemed inappropriate. This is to ensure that no offensive comments are left on the site. Please do not post any offensive or abusive comments as they will be removed immediately.